Statement jeans are a favorite for all style mavens. This cropped version gives you movement and sass with tassels that adorn the bottom. The blend is lightweight and features a beautiful and ornate embroidered trim. Ah, the glamour … it's effortless. 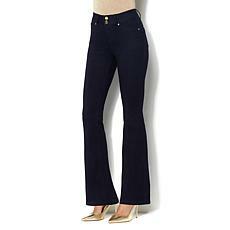 A sequined design draws attention to the raw, asymmetric hem of these cropped jeans. Show off your favorite shoes and your eclectic taste in distinctive jeans that offer a stylish segue to summer.